The National Monument, or Monas (a contraction of its name in Bahasa - Monumen Nasional), was a project of the first President of Indonesia - Sukarno (the Javanese often use one name only). Throughout his turbulent reign, Sukarno sought to bring Indonesia together with tangible symbols of nationhood; as the Istiqlal Mosque was his attempt to unite Muslim Indonesians, the Monas was his effort to create a lasting memorial to the Indonesian independence movement. Towering over Merdeka (Freedom) Square in Gambir, Central Jakarta, the Monas is an impressive-sized monolith: about 137 meters tall, topped with an observation deck and a gilded flame that is illuminated at night. At its base, the Monas houses a museum of Indonesian history and a meditation hall that displays an authentic copy of the declaration of Indonesian independence read out by Sukarno upon their country's emancipation from the Dutch. If only to understand Jakarta's place in Indonesia's history, you should make the Monas an essential stop in your Indonesia itinerary. At least, make it the first in a list top things you can do while in Jakarta. President Sukarno was a man who dreamed big - with the Monas, he wanted a memorial to the struggle for independence that would last for the ages. With the help of architects Frederich Silaban (designer of the Istiqlal Mosque) and R.M. Soedarsono, Sukarno envisioned the towering monument as a symbiosis of multiple auspicious symbols. Hindu imagery is present in the Monas' design, as the cup-and-tower structure resembles a lingga and yoni. The numbers 8, 17, and 45 hearken back to August 17, 1945, the date of Indonesia's proclamation of independence - the numbers manifest themselves in everything from the height of the tower (117.7 meters) to the area of the platform it stands on (45 square meters), even down to the number of feathers on a gilded Garuda sculpture in the Meditation Hall (eight feathers on its tail, 17 feathers per wing, and 45 feathers on its neck)! Immediately upon emerging from the other end of the tunnel, visitors will find themselves in the outer yard of the monument, where walls bear relief sculptures showing significant moments of Indonesian history. The tale begins with the Majapahit Empire, which reached its peak in the 14th century under the prime minister Gajah Mada. As you progress clockwise around the perimeter, the historical depictions move to more recent history, from the colonization by the Dutch to the proclamation of independence to the bloody transition from Sukarno to his successor Suharto in the 1960s. At the northeastern corner of the monument's base, the entrance to the Indonesian National History Museum leads to a large marble-walled room with a series of dioramas dramatizing key moments in Indonesian history. As you ascend within the cup that forms the base of the monument, you may enter a Meditation Hall that exhibits numerous symbols of Indonesian nationhood on the inner, black-marbled walls that make up part of the tower shaft. A gilded map of Indonesia stretches across the northern wall of the Meditation Hall, while a golden set of doors mechanically opens to reveal a copy of the original proclamation of independence read out by Sukarno in 1945, as strains of patriotic music and a recording of Sukarno himself fill the air. The southern wall features a gilded statue of Garuda Pancasila - an allegorical eagle emblazoned with symbols standing in for the "Pancasila" ideology established by Sukarno. A large viewing platform at the top of the monument's cup offers a good vantage point at an elevation of 17m from which to view the surrounding Jakarta metropolis, but the best view is available at the observation platform at the top of the tower, 115 meters above ground level. A small elevator on the southern side grants access to the platform, which can accommodate about fifty people. The view is hindered somewhat by steel bars, but several viewing binoculars allow visitors to pick out interesting sights around the park perimeter. Not visible from the viewing platform - but very visible from the ground - is the 14.5 ton Flame of Independence, covered by 50 kg of gold foil. 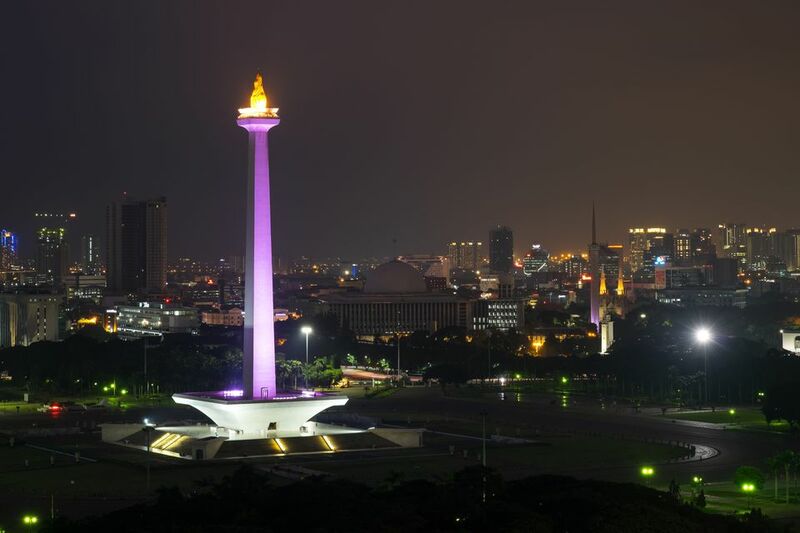 The flame is illuminated at night, allowing the Monas to be seen from miles around even after dark. Monas is most easily accessible via taxi. The TransJakarta Busway also reaches Monas - from Jalan Thamrin, the BLOK M-KOTA bus passes by the monument. Read about transportation in Indonesia. Merdeka Square is open from 8am to 6pm. Monas and its exhibits are open every day from 8am to 3pm, except for the last Monday of every month, when it is closed for maintenance.